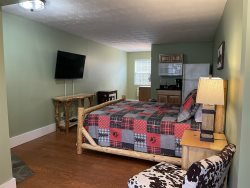 This beautiful Vacation Rental is nestled in the heart of Helen within walking distance to most local attractions. One block off of Maine Street and two blocks from the center of town, you will easily be able to access all of your hearts desires. Our units come fully furnished with all linens for your stay. If you should need anything during your stay our office is just a few steps away.